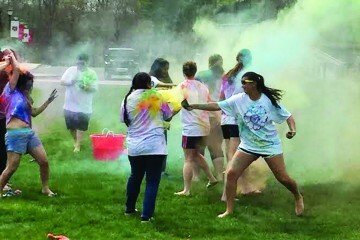 On Friday, April 12, the John A. Barone Campus Center Lawn became a vibrant source of color and light as Fairfield University students gathered for the celebration of Holi. Holi is a Hindu spring festival celebrated in honor of the god Krishna, the god of compassion, tenderness and love in Hindu tradition. During Holi, people join together and play with colored powder called Gulal, placing and throwing colors on each other and promoting a feeling of togetherness and positivity. The Gulal at the Fairfield celebration of Holi ranged from ruby red to bright yellow, lime green to sunset pink, ocean blue to sunrise orange. The mixture of all these colors flying through the air above the crowd of laughing, dancing, shouting and happy students mingling on the crisp green grass on the BCC lawn brought an uplifting spirit to the Friday afternoon, especially on such a warm and sunny day. Junior Gia Pham, vice president of the South Asian Students Association, said that one of the main purposes of the event is to connect students of different backgrounds to learn about the diversity within Fairfield. 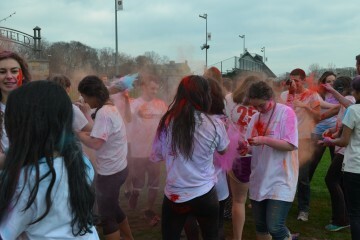 The 2019 celebration of Holi was Stephanie Brij-Rai ‘21’s second year participating in Holi at Fairfield. “I love this event because it allows me to celebrate my culture at my school, with my friends,” Brij-Rai said. Sophomore Alannah Merritt and Nicholas Colorito ’21, both friends of Brij-Raj, agreed that they loved the vibrant atmosphere and the positivity of the celebration of Holi. “This is my first year attending Holi, and I am really happy I got to celebrate my friends’ culture!” Colorito said as he basked in the red colored powder flying through the air. Merritt smiled as she picked up a handful of blue powder and threw it in the air. “I enjoy being able to celebrate my best friend’s culture with her,” Merritt said. 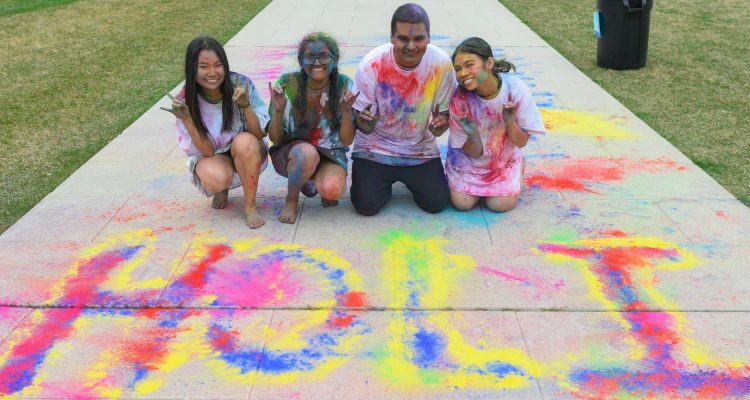 First-year Aarushi Vijay commented that Holi “reinforces the spirit of enjoying and celebrating,” before she went back to reveling in the joy of Holi. Vijay is an international student from India. 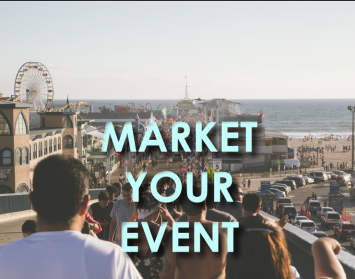 During the festivities, one person would smudge a bit of colored powder onto another person’s face, and the other person must smudge color back onto the first person’s face. There were also times when one person would grab a handful of color and chase another person, who then had to run from the impending splash of color. DJ Akkash played a festive mix of upbeat tunes throughout the event, which prompted many impromptu dances. At one point, one of the revelers opened up one of the pale pink packets of color. Soon, a wave of pale pink color went flying through the air, covering everyone in sight. The crowd began to shriek with laughter. Undergraduate and graduate students gathered in the pink rosy dust, arms outstretched, joy in their eyes, hair flying free. I felt the spirit and the connection between all the students at that moment, and I paused only briefly to jot down the description of the celebration before I went to join in myself. When you are surrounded by such positivity and pure joy, why would you want to stand outside of the celebration for long?